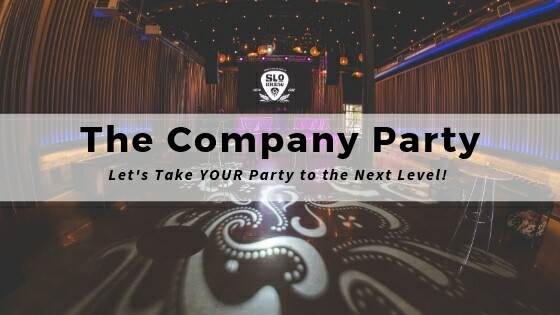 In previous posts, we have discussed the importance of throwing an annual company party for your team, and over the past few months, we have been honing in on ways to help make those gatherings a huge success! We recently held THE Company Party – a preview of services brought together to showcase just how amazing your party’s can be with the right team of professionals making things happen. Our party was a hit, and yours can be too! We have compiled the following list of steps to ensure that your next party is one for the books! 1. Pick your date – Before landing on a date for your party, we recommend you get feedback from your team. Give them a few options and run with the one that picks up the most steam. 2. Pick your Venue – With hundreds of venues to choose from, making this decision can feel daunting but it doesn’t have to be. Kramer Events can help with our Find a Venue Page. 3. Food – Everyone loves it, so make sure you put careful consideration into your meal choice. Let your guests know what to expect. Appetizers, full meal? They will appreciate you giving them this information so they can plan accordingly. 4. Transportation – There is nothing more important than getting your guests safely from point A to point B. So ensure you have quality transportation lined up! 5. Entertainment – is hugely important to the success of your corporate party. Do you want to have guests dancing, or do you think your crowd would be better suited for playing games with one another? We couldn’t have brought our company party together without the help of the following partners and all around rad Central Coast Vendors. Slo Brew Rock. 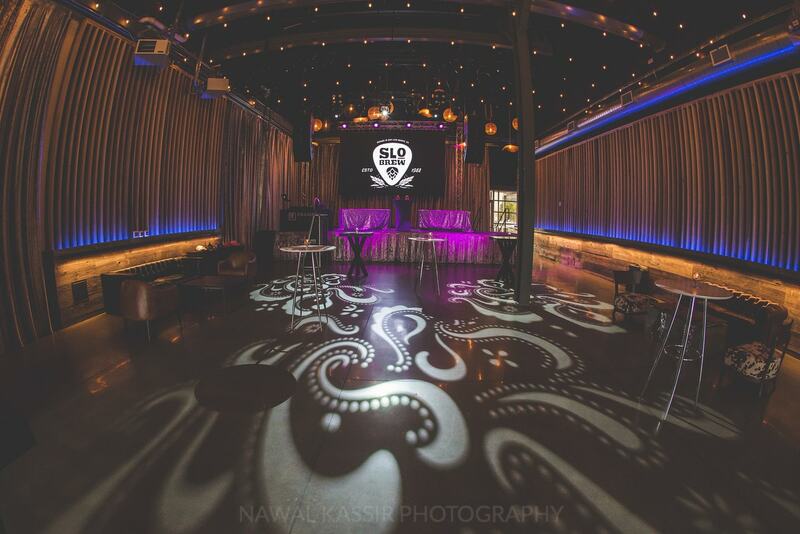 They transformed their space into the perfect setting for a corporate party. Bright Event Rentals added a touch of ambiance with their comfortable and stylish lounge furniture. Rod and Hammer’s Slo Stills provided high quality spirits and mixed drinks. Obsidian Luxury Services offered safe rides home for any guests who needed transportation in their luxurious vehicles. Our Kramer Events game show was so much fun, host Nick Malizia is one of the funniest guys we know, and kept the crowd laughing. During the second portion of the event, DJ Miles got everyone vibing with the music, and all three of our photo booths were on display with their brand new features! 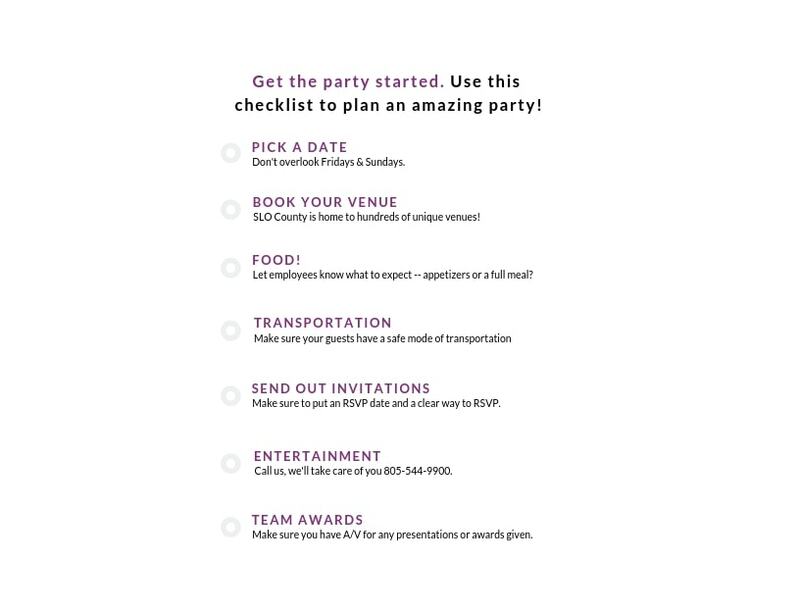 and be sure to follow the checklist below to ensure your next company gathering is all you wish it to be!